Event is sold out and registration is closed for the 2018 AOTC. Registration for the 2019 AOTC will open in October, 2018. The Ride is Saturday, April 7th, 2018. This ride sold out before January last year (we cap the ride at 1,000). Sign up early next year--we'll open registration for the 2018 ride on October 27th, 2017. 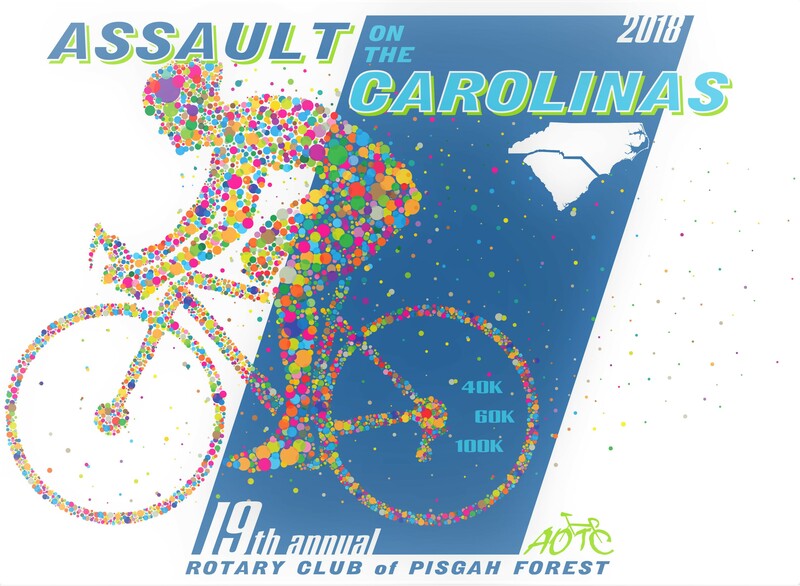 The Assualt on the Carolinas is the annual fundraiser for the Pisgah Forest Rotary Club. We offer a 100k, 60k, and 40k rides. The 100k goes through NC/SC mountains and valleys. Fully supported ride with 4 well stocked rest stops, and a challenging 6 mile climb up Ceasar's Head. The 60 and 40k go through the river valleys of Scenic Transylvania County. Great early season ride to kick off the cycling season! Traffic Support, Lunch Afterwards, and T-shirts guaranteed to all who pre-register. All proceeds benefit Rotary's charities. We strive to make everything about this year's ride 1st class. Ride date: Saturday, April 7th, 2018. Saturday, October 7th, 2017 - Early bird registration opens. December 31st, 2017 - Early bird registration ends. 6:00-9:00pm - Early check in, rider packet / t-shirt pickup at American Legion, 56E Jordan Street (1 block south of start line). 7:00-8:50am - Check in and rider packet / t-shirt pickup at 56E Jordan Street (1 block south of start line). There will be no day-of registrations. 8:50am - Ride announcements and rider line up, East Main Street.